IPT is the first company in Lebanon to introduce the Self-Service gas station concept. This is yet another of our pioneering drives. IPT Self-Service puts you in control and even helps you save money since you don’t have to tip. It also increases efficiency and saves time since there are shorter wait times. Because we always offer you more, our Self-Service also provides you with everything you need to refill water and clean your windshield yourself. Also while using IPT self-service you will save 1,000 L.L. on every 20 Liters gasoline. At IPT, we are keen to thank you for taking initiative and so whenever you use your IPT Self-Service Rewards Card, you will accumulate points and redeem them with valuable gifts and services. 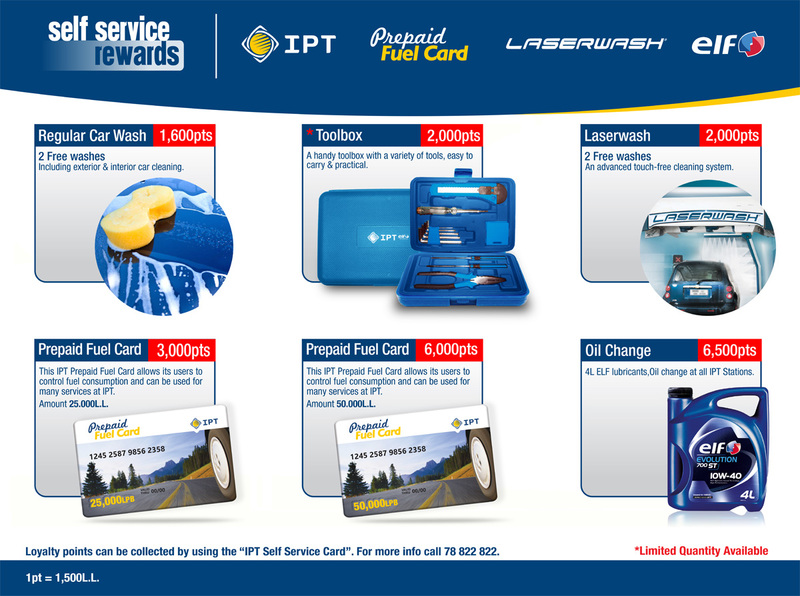 Check here the "IPT Self Service Card Rewards Bundle 2018-2019" tailored to help you get rewards faster.